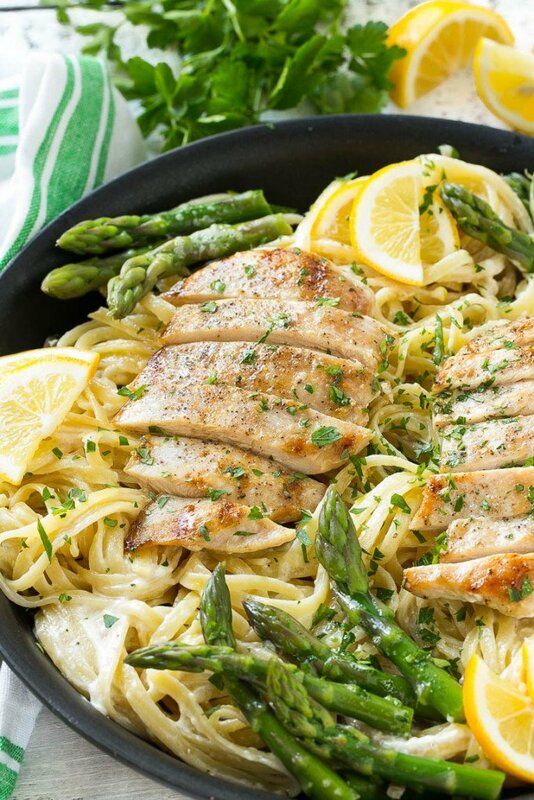 This recipe for lemon asparagus pasta combines tender asparagus and grilled chicken with pasta in a lemon cream sauce. It’s a delicious and hearty entree that everyone will want seconds of! 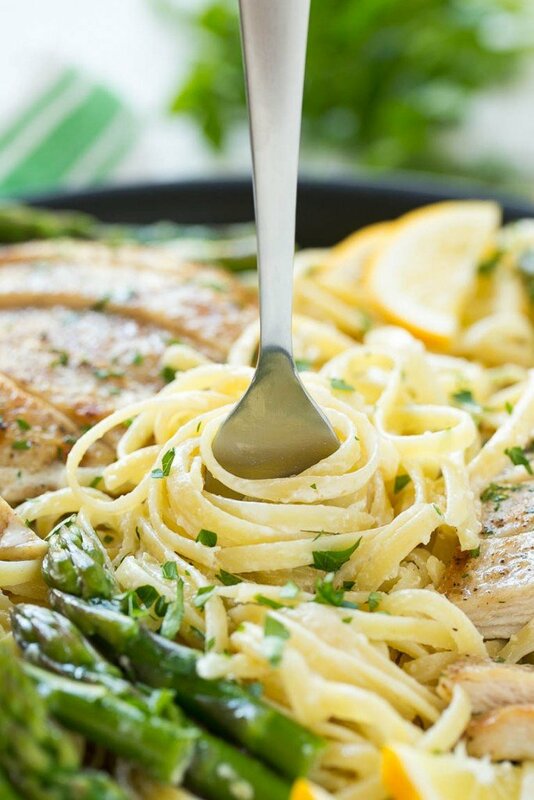 I am a huge fan of easy pasta dishes, some of my all time favorites include chicken parmesan pasta, chicken and broccoli pasta and this lemon asparagus pasta. Spring has sprung here in California – the trees are full of blossoms, the temperature has been around 70 degrees and spring produce is starting to pop up in stores. When I saw that asparagus was on sale I had to pick up a bunch to have for dinner, and that’s how this lemon asparagus pasta with grilled chicken came to be. How do you make lemon asparagus pasta? There are a few components to this dish – the chicken, the pasta and the asparagus. 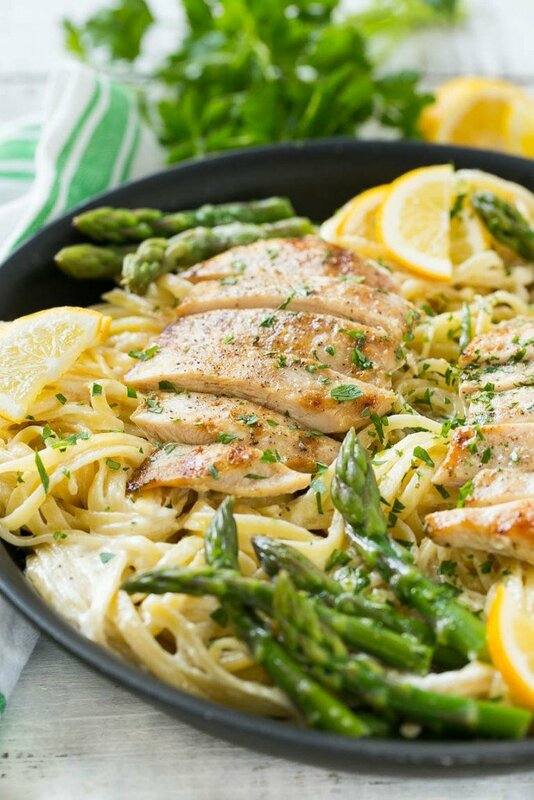 Lately I’ve been grilling up a big batch of chicken on Sunday night and adding it to our meals throughout the week, including in this lemon asparagus pasta. If you don’t want to fire up the grill you could use sauteed chicken or even sliced chicken breast from a rotisserie chicken. I went with linguine pasta here but spaghetti or fettuccine would also be great. The asparagus cooks along with the pasta, which is super convenient – you know I’m all for using less pans whenever possible! The creamy lemon sauce only has 4 ingredients and takes less than 5 minutes to make. In my opinion it’s the perfect way to showcase asparagus – the hint of lemon really accentuates all of the flavors. Put it all together, stir in some parmesan cheese, a sprinkle of parsley, and you’ve got an amazing dinner that everyone will go crazy for! 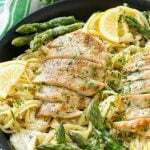 This recipe for lemon asparagus pasta combines tender asparagus and grilled chicken with pasta in a lemon cream sauce. It's a delicious and hearty entree that everyone will want seconds of! Cook the pasta in salted water according to package instructions. Add the asparagus to the pot during the last 3 minutes of cooking time. Reserve 1/4 cup of pasta cooking liquid. In small pot, combine the heavy cream, butter and 1/2 teaspoon salt and 1/4 teaspoon pepper over medium-high heat. Bring to a simmer and cook, stirring, until thick enough to coat a spoon, about 4 minutes. Remove from the heat and stir in the lemon zest and juice. Add more salt and pepper to taste if needed. Garnish with chopped parsley and lemon slices if desired. I’m dairy free…..do you have a suggestion for something other than cream? Can a almond milk be used? You could use an almond milk, but you’d need to add a thickener such as cornstarch, because cream is much thicker than almond milk. Very easy to make! The lemon adds a great flavor. We loved it! So simple and absolutely delicious. We all loved it and would not change anything. It shouldn’t curdle, I’ve never had that happen before. Are you adding the lemon juice off the heat? I cannot wait to make this for dinner tomorrow night! It looks amazing, quick and easy, AND for once, I have all the ingredients ! I’m sure it will 4 or 5 stars! Excellent dish! Easy to make. This is one I make quite a bit. Thank you!